Eckhart Tolle’s profound yet simple teachings have helped countless people throughout the world find inner peace and greater fulfillment in their lives. At the core of the teachings lies the transformation of consciousness, a spiritual awakening that he sees as the next step in human evolution. We hope you’ll enjoy this excerpt from his New York Times bestseller The Power of Now: A Guide to Spiritual Enlightenment, in which he explains what “watching the thinker” means. When the side effects of her “life-saving” medication became worse than the disorder that had started the drug regimen, Michelle Schoffro Cook sought an alternative. 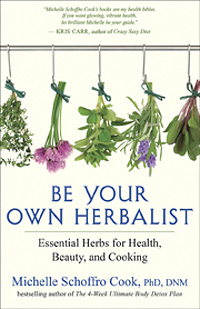 She began studying herbal medicine and used it to wean herself from the pharmaceuticals. We hope you’ll enjoy this short interview with Linda and Charlie Bloom, authors of Happily Ever After... and 39 Other Myths about Love, as they talk about common relationship myths and offer some great advice on what to do about them. They discuss what to do when you need more reassurance, whether or not people can change, and what to do when your partner wishes you would just read their mind. We also invite you to subscribe to New World Library’s YouTube Channel for immediate access to our latest author interviews, book trailers, and more. Productivity specialist Helene Segura has seen her clients succumb to all the pitfalls of overwork: executives whose marriages fall apart because they're never home or, when they are at home, don't pay attention to their family because they're still working; or those who work their tails off to succeed and end up working themselves into emotional overload by trying to juggle too many of life's pieces. For these people and all others who sometimes struggle with time management, Segura wrote The Inefficiency Assassin: Time Management Tactics for Working Smarter, Not Longer. We hope you'll enjoy this excerpt from the book. Have you ever tried to stop your mind from thinking? It’s not easy, right? In our society of more and better, our minds are constantly cluttered with mental noise. You don’t realize how much overthinking controls your day until you collapse in bed at night. We hope you'll enjoy this short video, in which author Helene Segura offers time management tactics for working smarter, not longer. We also invite you to subscribe to New World Library's YouTube Channel for immediate access to the latest author interviews, book trailers, and more.